BACKGROUND AND PURPOSE: Patient selection for percutaneous vertebroplasty is often complicated by the presence of multiple fractures or non-localizing pain. Our purpose was to determine whether increased activity revealed by bone scan imaging is predictive of a positive clinical response to percutaneous vertebroplasty. METHODS: A retrospective chart review conducted at our institution yielded 28 vertebroplasty treatment sessions that had been performed after obtaining bone scan imaging for painful, osteoporotic compression fractures in 27 patients. Thirty-five compression fractures were treated during these 28 treatment sessions. In all cases, increased activity was revealed by bone scan imaging before treatment with vertebroplasty. Positive outcome was defined as subjective decrease in pain severity and/or increased level of patient mobility. RESULTS: Subjective pain relief was noted in 26 (93%) of 28 treatment sessions. In 14 (100%) of 14 cases with quantifiable pain levels, pain improved at least 3 points on a 10-point scale (range of improvement, 3–10 points; mean improvement, 7.4 points). Among the remaining 14 treatment sessions in which patients were unable or unwilling to quantify pain severity, the pain relief was described as complete or excellent pain relief in 11 (78%) of 14 cases. In 14 (100%) of 14 cases for which semiquantitative assessment of mobility was available, mobility improved at least one level (5-point graded scale; range of improvement, 1–4 points; mean improvement, 1.7 points). CONCLUSIONS: Increased activity revealed by bone scan imaging is highly predictive of positive clinical response to percutaneous vertebroplasty. Vertebral compression fractures represent a common cause of severe back pain among the elderly population. Sixteen percent of postmenopausal women suffer one or more vertebral compression fractures during their lifetime (1). In a significant percentage of cases, the pain related to the compression fracture persists despite bedrest and medical therapy. Percutaneous vertebroplasty, the injection of polymethylmethacrylate (PMMA) into vertebral compression fractures, has become an accepted method of treatment for painful osteoporotic compression fractures (2–9). It has been reported that with proper patient selection, long-lasting relief of pain related to vertebral compression fractures can be achieved with percutaneous vertebroplasty (3). The ideal candidate for vertebroplasty presents within 4 months of the time of fracture and has midline, non-radiating back pain that increases with weight bearing and can be exacerbated by manual palpation of the spinous process of the involved vertebra. As experience with vertebroplasty increases, patients present, who, for various reasons, do not satisfy all above-cited criteria. Many have multiple fractures and lack sufficient imaging studies to document the age of some or all of their fractures. Other patients have several adjacent fractures that present difficulty in determining, by physical examination, which of the fractures is symptomatic. Still other patients have typical subjective pain patterns for vertebral compression fractures but experience no pain on palpation over the involved vertebra. To our knowledge, there have been no previous studies reporting the use of adjunctive imaging strategies beyond plain film imaging to properly select patients who will experience pain relief with vertebroplasty. We report our experience using bone scan imaging to guide patient selection for vertebroplasty. We performed a retrospective chart review of patients treated with percutaneous vertebroplasty for painful vertebral compression fractures at our institution between May 1995 and October 1999. This chart review was performed to identify patients who had undergone bone scan imaging as part of their preprocedural workup. In our vertebroplasty practice, which is limited primarily to the treatment of painful, osteoporotic vertebral fractures rather than neoplastic compression fractures, we rely on plain film imaging and physical examination to determine whether a particular fracture is causing pain that would be relieved with vertebroplasty. If the patient has plain film evidence of a subacute fracture and experiences pain on palpation localized to the fracture level, no further workup is performed before proceeding with vertebroplasty. In problematic cases, we rely primarily on bone scan imaging to guide our therapy. We request bone scan imaging in cases in which the age of the vertebral fracture is unknown, physical examination does not induce pain on palpation localized over a fracture site, or multiple fractures are present. We typically offer vertebroplasty in cases in which the bone scan images reveal increased activity at one or more fracture sites and usually treat, in a single session, all levels that show increased activity. Among a total of 130 patients treated with vertebroplasty, 34 had undergone bone scan imaging before undergoing vertebroplasty. In all of these 34 cases, vertebroplasty was performed in vertebrae that showed increased activity on bone scan images. 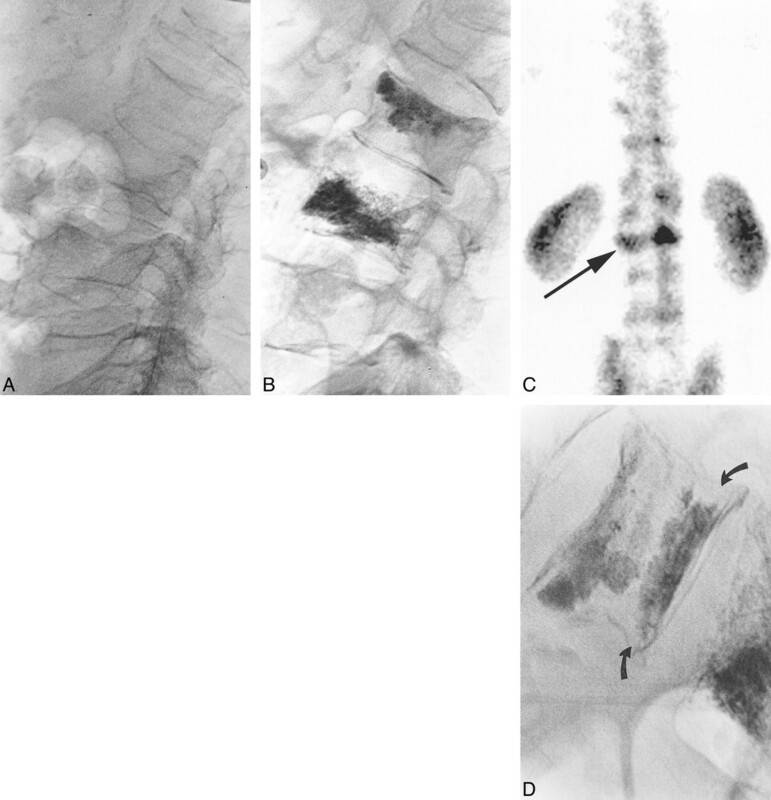 The locations treated were in the mid-thoracic section (T5–T8) in 11 cases, lower thoracic section (T9–T12) in eight cases, upper lumbar section (L1–L2) in nine cases, and lower lumbar section (L3–L5) in seven cases. Vertebroplasty was typically not performed in cases of compression fractures that did not show increased activity on these bone scan images. Clinical follow-up was available for 27 (79%) of the 34 patients. The 27 patients included 19 women and eight men. Patient ages ranged from 49 to 98 years, with a mean age of 74.8 years. For these 27 patients, a total of 35 fractures were treated, yielding an average of 1.3 treated fractures per patient. One of 27 patients was treated on two separate occasions, in both instances after positive bone scan imaging findings. Another was treated with vertebroplasty in a separate portion of a previously treated vertebral fracture. Fifteen (56%) of 27 patients had fractures that were secondary to postmenopausal osteoporotic changes in association with minor trauma. Four (15%) of 27 patients had fractures that were related to chronic steroid-induced osteoporosis. Seven (26%) of 27 patients had fractures that occurred as a result of male osteoporosis. One (4%) of 27 patients had a fracture caused by trauma without osteoporotic changes. Generally, bone scan imaging was performed 2 hours after the IV administration of 20 mCi 99mTc MDP IV. Patients were placed in a supine position on the imaging table, in proper orientation for a whole body sweep. Spot views for the trunk went for at least 1000 k at a 256 × 256 format. Data were processed using a 1.4 gray scale for all images. Experienced radiologists (D.F.K., M.E.J.) qualitatively evaluated the activity of the vertebral bodies in question. Activity within fractured vertebrae was compared with that within adjacent, non-fractured vertebrae. If the image showed increased uptake within a vertebral compression fracture, then that vertebral body was treated with PMMA injection. The technique of performing percutaneous vertebroplasty generally is as follows. An 11-gauge bone biopsy needle is advanced into the anterior third of the vertebral body via the transpedicular approach. Needle placement is confirmed with the injection of 3 to 5 mL of contrast medium, using two frames per s biplane digital subtraction angiography. The cement material is prepared by combining PMMA powder with sterile barium sulfate for opacification and tobramycin powder for infection control and then adding liquid monomer for a thin, “cake glaze” consistency. The PMMA is injected under fluoroscopic monitoring until adequate filling of the vertebral body is attained. Cement injection is considered complete when the cement reaches the posterior fourth of the vertebral body on the lateral projection. Injection is terminated if the cement preferentially flows across endplate fractures or into the adjacent veins. Often, the material remains in the hemivertebra and the procedure is repeated in the contralateral hemisphere. In instances in which the cement crosses the midline to the medial border of the opposite pedicle, the opposite side is not punctured (3). Pre- and postprocedural clinical assessment focused primarily on the severity of the pain. Patients were asked to provide a value for pain intensity using a semiquantitative scale ranging from 0 to 10, with 0 representing “pain free” and 10 representing “the worst pain of your life.” Some patients were unable or unwilling to quantify their pain. In those cases, we urged the patients to describe the pain relief from the procedure qualitatively as complete pain relief, excellent or significant pain relief, moderate pain relief, minimal pain relief, or no pain relief. A positive clinical response was defined as a 3-point or greater improvement in the quantitative pain scale or any improvement in the qualitative pain scale. When possible, mobility was assessed using the following semiquantitative scale: 0, walking without assistance; 1, walking with assistance; 2, wheelchair-bound; 3, activity restricted to sitting in bed; 4, activity restricted to laying flat in bed. All patients were first contacted for follow-up no later than 90 days after undergoing vertebroplasty (range, 1–90 days; mean, 15.7 days). Patients were then contacted periodically to assess postprocedural improvement, with last follow-up occurring no later than 32 months after undergoing vertebroplasty (range, 1 week–32 months; mean, 5.7 months). Twenty-six (93%) of 28 treatment sessions resulted in decrease in the level of pain after vertebroplasty was performed. In 14 (50%) of 28 treatment sessions, patients were able to quantify their pain. All (100%) 14 cases with quantifiable pain levels improved at least 3 points (range of improvement, 3–10 points; mean improvement, 7.4 points). In 14 treatment sessions in which patients were unable or unwilling to quantify their pain severity, pain relief was described as complete or excellent pain relief in 11 (78%) of 14 cases, moderate improvement in one (7%), and unchanged in two (14%). In summary, when pain relief is defined as a 3-point or greater improvement in the semiquantitative pain scale or excellent, complete, or moderate improvement in the qualitative scale, then 26 (93%) of 28 cases showed pain relief after vertebroplasty when using bone scan imaging to guide therapy. Semiquantitative assessment of mobility was available in 14 (50%) of 28 cases. In all (100%) 14 cases, at least one level of improved mobility was noted (range of improvement, 1–4 points; mean improvement, 1.7 points). Illustrative cases are shown in Figures 1 and 2. Images from the case of a 79-year-old man who presented with a history of back pain of several months' duration. Although the patient complained of mid and low back pain, he did not experience localizing pain during physical examination. A, Lateral view plain film radiograph of the thoracic spine shows wedge compression fracture at T11 (arrow). B, Lateral view plain film radiograph of the lumbar spine shows wedge compression fractures at L4 (arrow) and endplate compression fractures of L1, L2, and L3. C, Posterior planar Tc99m-MDP bone scan image shows markedly increased activity at L4 (large arrow) and minimal increased activity over the pedicles or facets of T11 (small arrows). Based on increased activity over L4 and relative lack of increased activity at other fracture sites, we proceeded with a single-level vertebroplasty at L4. D, Lateral view plain film radiograph of the lumbar spine after vertebroplasty shows barium-opacified methylmethacrylate within the L4 vertebral body (arrow). The patient experienced complete pain relief after treatment. Before treatment, the patient's mobility was limited to walking with assistance. After treatment, he was able to walk without assistance. Images from the case of a 77-year-old man who presented with back pain of 3 months' duration. A, Lateral view plain film radiograph obtained over the lumbar spine shows fractures at L1–L5. No previous images were available to date the onset of fracture at any level. However, because the patient experienced focal tenderness over the spinous processes of L2 and L3 without tenderness over the other fracture levels, we elected to proceed with vertebroplasty at L2 and L3, without performing preprocedural bone scan imaging. B, Postprocedural lateral view plain film radiograph obtained over the lumbar spine shows barium-opacified methylmethacrylate within the L2 and L3 vertebral bodies. Cement injection at L3 traversed the entire marrow cavity. Cement selectively traversed the superior endplate region at L2, which is commonly seen as the cement naturally extends into fracture lines. Subjectively, the patient improved “about 50 percent,” but he requested further treatment, if possible. Bone scan imaging was performed because of uncertainty regarding further therapy. C, Posterior planar Tc99m-MDP2 bone scan shows increased activity in the region of the L2 fracture (arrow). Based on the bone scan image, which suggested ongoing bone turnover in L2, we selectively targeted the inferior aspect of L2 for the second vertebroplasty treatment. As percutaneous vertebroplasty disseminates to reach a progressively wider array of patients, case selection becomes increasingly difficult. Unlike during the early development of vertebroplasty, when patients would present with single, acute fractures and excellent film documentation, our current practice includes many patients with subacute or chronic pain in the setting of multiple fractures of uncertain age. In some cases, the results of physical examination may be compelling, indicating the painful vertebra or vertebrae. In most cases, however, physical examination is unrevealing and adjunctive tests may be required. This study shows that increased activity revealed by bone scan imaging in a vertebral compression fracture is highly predictive of positive outcome after vertebroplasty. Among a series of 28 cases, pain relief was achieved in more than 90% of the treatment sessions. This cohort represents a particularly challenging series of patients in that many of them presented with multiple fractures of uncertain age and did not have localizing pain revealed by physical examination to guide vertebroplasty therapy. Our results suggest that bone scan imaging may be of value in guiding therapy in patients presenting with vertebral compression fractures, especially when multiple fractures are present or the pain is not localizing in nature. Previous reports have shown high rates of pain relief after percutaneous vertebroplasty. Cotten et al (10) reported a series of 37 patients with painful vertebral lesions, either metastases or myeloma, in which greater than 90% of the patients experienced improvement in pain after undergoing vertebroplasty. Localizing the level of pain might be easier to achieve in treating patients with vertebral lesions, such as metastases or myeloma, than in treating those with multiple osteoporotic fractures of uncertain age, as in our series. Previous reports have indicated a 90% rate of improvement after vertebroplasty in a series of 29 patients with osteoporotic compression fractures (3). Unlike the current series, that group of patients typically experienced localized pain on palpation over one or more fractures, rendering treatment decisions relatively straightforward without adjunctive imaging techniques. We consider it notable that we were able to achieve a similar rate of improvement in this difficult patient population. Other techniques, including CT and MR imaging, might also be useful in triaging patients before performing vertebroplasty therapy. Signal changes within the marrow of the vertebral body on MR images may suggest edematous changes in a healing fracture. Correlation of bone marrow edema using sequences that are particularly sensitive to the presence of edema, such as fat-suppressed T2-weighted imaging or fat-suppressed inversion recovery imaging, may also be useful in guiding vertebroplasty therapy. MR imaging offers the advantage over bone scan imaging of accurately assessing the degree of bony retropulsion or other findings that some practitioners may find useful. We have favored the use of bone scan imaging over MR imaging to distinguish painful fractures from healed fractures for two reasons. First, the bone scan image provides a functional assessment of bone turnover, which would be increased in a healing fracture. Second, because we frequently evaluate patients who travel long distances to be seen and treated by us and because it is difficult to obtain MR images on short notice, we have turned to bone scan imaging, which can be performed on short notice before performing vertebroplasty. It may prove helpful in future studies to compare the usefulness of MR imaging with that of bone scan imaging in patient selection for vertebroplasty. Although this study suggests a striking benefit of bone scan imaging to guide therapy in vertebroplasty, it suffers several limitations. First, it was retrospective in nature. Quantification of pain and mobility was unavailable in many cases. In all likelihood, complete follow-up among our series would have shown even more compelling usefulness of bone scan imaging than we have shown here. Also, it would have been useful to know which patients had no localizing pain revealed by physical examination to delineate the usefulness of bone scan imaging further in difficult cases. Another limitation of this study is that of workup bias (11). In other words, patients were treated with vertebroplasty after a positive bone scan image was obtained; patients with negative bone scan images were excluded from this series. Thus, although the value of increased activity revealed by bone scan imaging has been shown, the relevance of normal activity revealed by bone scan imaging of a vertebral compression fracture is less certain based on our data alone. It is entirely possible that patients without increased activity would also experience excellent pain relief after undergoing vertebroplasty; however, many of our patients presented with multiple fractures and gained complete pain relief after treating only those fractures with increased activity. Bone scan imaging may reveal increased activity for up to 2 years after fracture, yet we have noted in other studies that patients with fractures of longer than 6 months' duration typically do not benefit from vertebroplasty (12). This disparity in duration of increased activity revealed by bone scan imaging as compared with the duration of the treatment window in vertebroplasty may explain the two cases that showed no improvement. Last, the placebo affect may account for many instances of pain relief. This study points to the need for prospective evaluations of not only the method for patient selection before vertebroplasty but also the methods of evaluating the clinical response after vertebroplasty. The former need might be met with a direct comparison of bone scan imaging versus MR imaging in predicting patient improvement. The latter need might be met with the use of standardized methods such as the visual analog scale, McGill-Melzack scoring system, or Nottingham Health Profile (2). 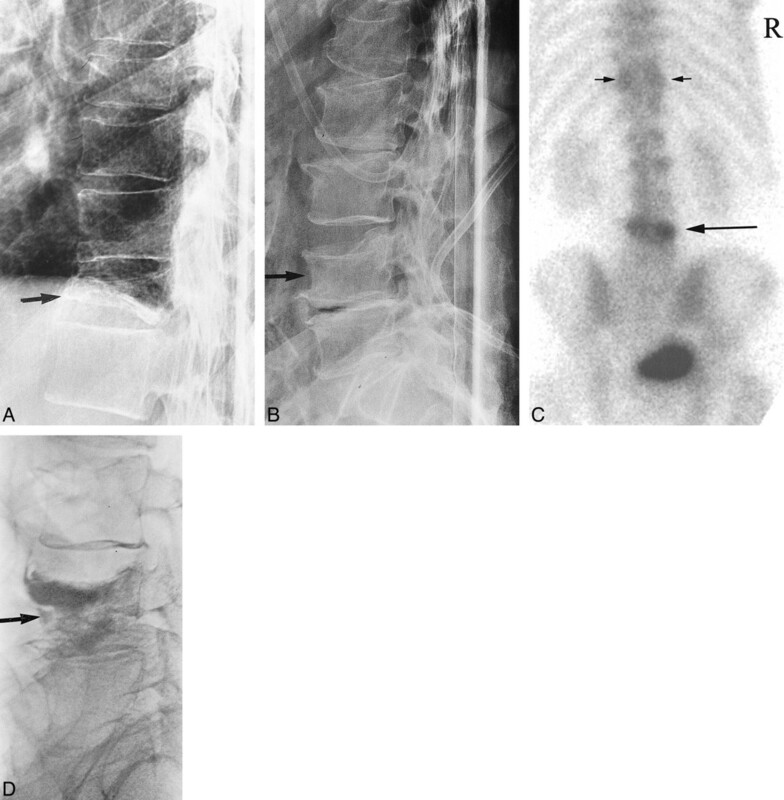 Increased activity revealed by bone scan imaging is highly predictive of positive clinical response to percutaneous vertebroplasty. Bone scan imaging may be indicated when considering vertebroplasty therapy for patients suffering from multiple vertebral compression fractures of uncertain age or in patients with non-localizing pain patterns. Bone marrow edema in osteoporotic vertebral compression fractures after percutaneous vertebroplasty and relation with clinical outcome.